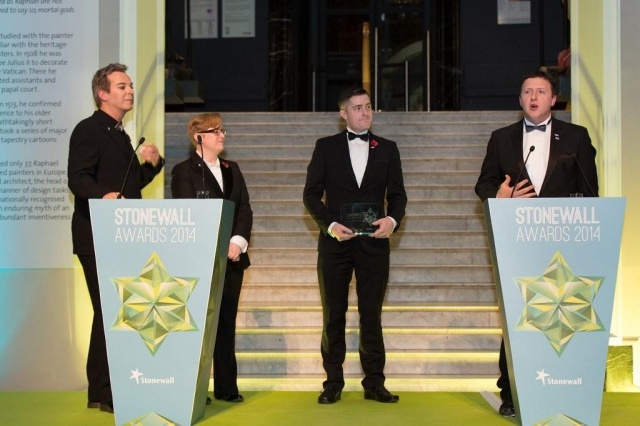 Pride House Wins at Stonewall Awards | LEAP Sports Scotland LEAP are the winners of the Sports Award at Stonewall UK Awards 2014. "> LEAP are the winners of the Sports Award at Stonewall UK Awards 2014. LEAP are the winners of the Sports Award at Stonewall UK Awards 2014. LEAP Sports Scotland have scooped the ‘Sports Award’ at the Stonewall UK Awards 2014 for this year’s acclaimed ‘Pride House Glasgow’ project. At a ceremony held in London's Victoria & Albert Museum earlier this month, Pride House found itself up against Casey Stoney, Michael Sam, Thomas Hitzlsperger and Stonewall FC Football Club. 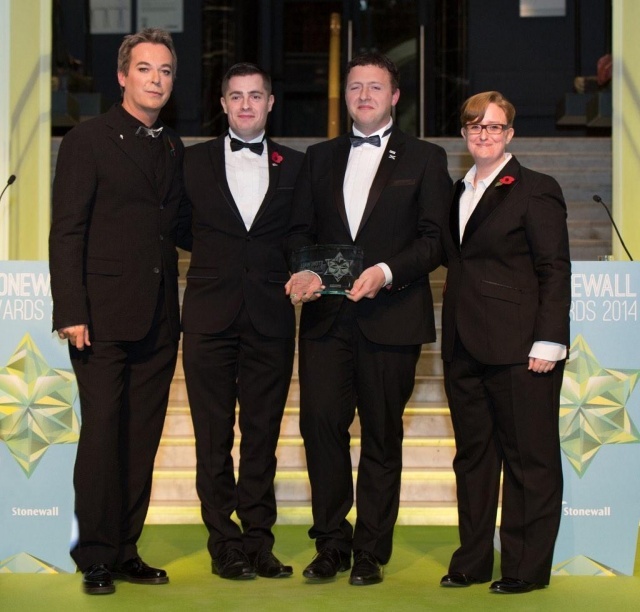 The award was presented by Stonewall Chief Executive Ruth Hunt and the legendary Julian Clary. Hugh Torrance, Chair of LEAP Sports Scotland, and Frazer Robertson, Vice Chair, were on hand to collect the award. Pride House Glasgow ran for 14 days during the Commonwealth Games in Glasgow this summer, running more than 80 events with over 6,000 people visiting or participating, and playing host to a veritable who’s who from the world of politics, sport and entertainment, as well as visitors and dignitaries from across the Commonwealth and the world. On accepting the award, Hugh Torrance paid tribute to the volunteers and community supporters who made the project such a success. Torrance also thanked key funders, Big Lottery Fund Scotland and The Scottish Government, praising the work of the Scottish Government and singling out their ongoing commitment to human rights legislation. LEAP Sports Vice Chair Frazer Robertson (centre) looks on as Hugh Torrance, Chair, urges awards attendees to support the Pride House movement. LEAP Sports were in good company as Scottish born journalist Liz MacKean took the Journalist of the Year award, whilst MSP Alex Neil made the shortlist for Politician of the Year. Written on 21st November 2014.